According to the new Space Report, published by the Space Foundation in conjunction with last week’s Space Symposium in Colorado Springs, 465 spacecraft were deployed in 2018 and of these, 36 percent were commercial, 29 percent were civil space missions and the remaining 25 percent were military missions. The U.S. Government Space Budget. Chart is courtesy of Space Foundation. This in-depth report, which is now updated quarterly instead of annually, has sections on the Space Economy, Workforce, Space Infrastructure, as well as Products and Services. The report is designed to improve understanding of the reach, impact and health of the space community and demonstrates how the economic and technical domain where government investments and expenditures previously dominated, has given rise to globally diverse, vibrant and technologically creative enterprises that are adept at creating new services, products and economic opportunities. Q1 2019 revealed increased U.S. investment in space, increase in commercial workforce, and record spacecraft deployments. U.S. government investment in space increased by 10 percent in 2018. 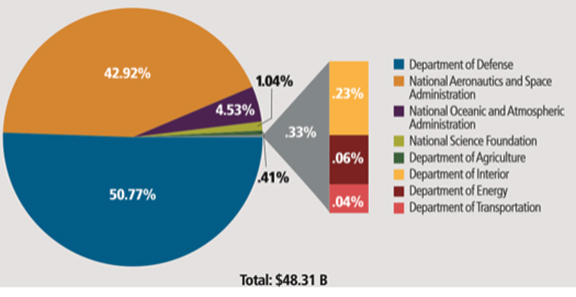 U.S. government space budget was $48.31 billion in 2018 with 43 percent of that devoted to NASA. Since 2011 employment in the U.S. space industry has decreased by nearly 10 percent compared to general U.S. employment which has increased by nearly 15 percent since that time. Commercial space workforce grew 3 percent from 2016-2017. This is the first reversal of over a decade of workforce declines. 22 percent of the NASA workforce was eligible for retirement. In 2018, the number of spacecraft deployed was a record-high, growing 5 percent from 2017’s record-high to 465 in 2018. Rich Cooper, Space Foundation Vice President - Strategic Communications and Outreach, said that for years, The Space Report has been the most authoritative guide to global space activity. That is a distinction and mantle of responsibility that everyone at the Space Foundation is inherently proud to possess. The organization's evolution of The Space Report continues that charge and stewardship, and the Space Foundation looks forward to sharing the space story for years to come. 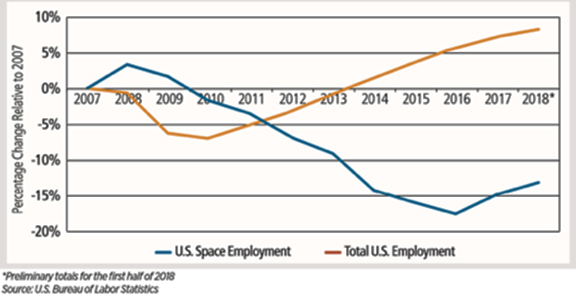 U.S. Space Industry Employment and U.S. Total Employment, 2007 to 2018. Chart is courtesy of Space Foundation. The now quarterly installments of The Space Report are designed to improve understanding of the reach, impact and health of the space community. The Space Report is available for purchase for $250 a quarter, or for $499 for all four quarters at https://www.thespacereport.org/pricing. The full PDF is also available to subscribers to The Space Report Online. Founded in 1983, the Space Foundation is a 501(c)(3) nonprofit that aims to inspire, educate, connect, and advocate on behalf of the global space community, and is a leader in space awareness activities, educational programs, and major industry events, including the annual Space Symposium.